The US Sailing Team is breathing a collective sigh of relief at the end of an incredibly tough week of regatta in Weymouth, UK. Sail for Gold, the sixth event on the World Cup regatta circuit, was also the first qualifier for the Olympic team (one of two events) and also a qualifier for the sole berth to compete in the Pre-Olympic Regatta, an Olympic test event held the first two weeks of August. I'm happy to say that my event went well and I finished as the top American RS:X woman and will compete in the Pre-Olympics. Although I placed 19th in the Silver fleet, qualified for the Pre-Olympics and felt that in general, I sailed to the best of my ability, I am looking forward to better results in the future. A few factors affected my results, including technique in the windy, planing conditions that persisted throughout the week, and the high level of the fleet. With the exception of the first day, we had planing conditions for the remainder of the regatta in winds of 15-25+ knots! Although I had many days practicing in planing conditions and was able to sort out my technique, I still need more practice to apply the proper technique during racing. During an event, recently learned techniques are difficult to apply consistently, as I and other sailors often revert to the muscle memories we are most familiar with. Before the regatta, the wind was light for almost the entire week, as it was for most of my training in France. 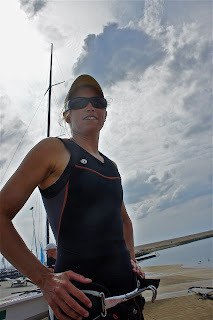 In France, I made major improvements to my sailing in marginal and non-planing conditions, which we saw almost none of during Sail for Gold. However, during the last few days of the event, I made improvements to my planing technique. The overall level of the fleet was extremely high, as many countries are using Sail for Gold as an Olympic qualifier and peak event of the season. The windy conditions meant that the results were more mixed up than is usual, and many sailors had a truly difficult event. In the women's fleet, several teams as a whole had a better performance and a few had worse. This was exemplified by the New Zealand team, who had a few members in the Gold fleet, more than they usually have; and the Italian, British, Chinese, and Netherlands teams, who had less than average performances. The usual strong European competitors, the French and Polish teams, dominated the fleet. Many US sailors had a tough time in Weymouth last week, and most of it was due to the windy conditions, the high level of the international fleets, and the focus on beating other team members in the first Olympic qualifier event. Closest home to my event in the RS:X men's fleet, Ben Barger placed behind Bob Willis, who has strong finishes in planing conditions. Both boys had a challenging time in the competitive fleet. Many US team members placed slightly lower than where they normally finish, including men's 470, Laser and Laser Radial. Although results may have been slightly "off," performances by the US team reflected their best efforts in the crazy conditions and top-level fleets. Achieving decent results despite our team's shortcomings is a great accomplishment for sailors as individuals. The "arms race" against fully-funded teams is difficult, and US sailors have many more issues to deal with than most of the top international sailors, all of which have an impact on our team's results. We all fight hard to sort out our funding, logistics, and other personal problems to do our best to prepare physically and mentally for competition. In the end, we are working with a management system that structurally is unable to support team goals as a whole, and too-new and unstable programs. Although we all have a challenging road ahead to stay abreast of the international fleet, we are all very positive and excited to improve and move forward. As the Olympics approach in one year's time, I'm really anxious to improve upon my training program even more. I'm happy with the progress I've made and am looking forward to getting the water time and coaching that I need. Next week I'm spending some time in San Francisco to get time in the extreme breeze, chop, and cold water, which I'm certain will advance me in Weymouth conditions. I'm really stoked about going to the Pre-Olympics and can't wait to get back to Weymouth to train. Click here for results; click on a tab to view full results for each Olympic class boat or board.